Instructor User Guide GradebookHow do I import grades into Gradebook? Note: The import file must be in a specific format in order to import correctly. It should be a CSV file and contain the appropriate student and gradebook item data. Please note the first column must contain student netIDs and that the second column must contain student names. Refer to the Download Gradebook export file for and example of the correct format. 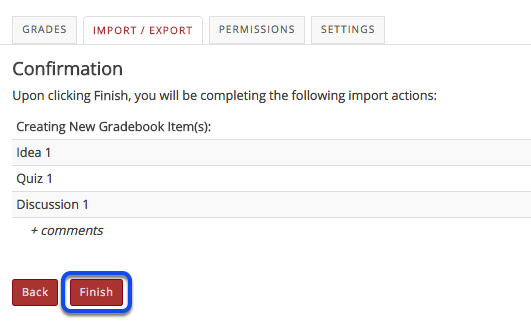 After locating and selecting your import file, click Continue to import the grades. Select the items to be imported. Zoom: Select the items to be imported. If you are creating new items as part of the import, you will be prompted to edit the item options for each new item. Select the desired options and click Next to continue. If you are importing updated scores for an item that already exists in the Gradebook, please note the Gradebook will recognize this change and will state the Status of the item as Update. You will still be prompted to select items you have updated if you would like to import those changes. Select the desired options and click Next to continue. You should receive a confirmation message on the import screen once your spreadsheet has been imported successfully. Next: How do I override a course grade in Gradebook?